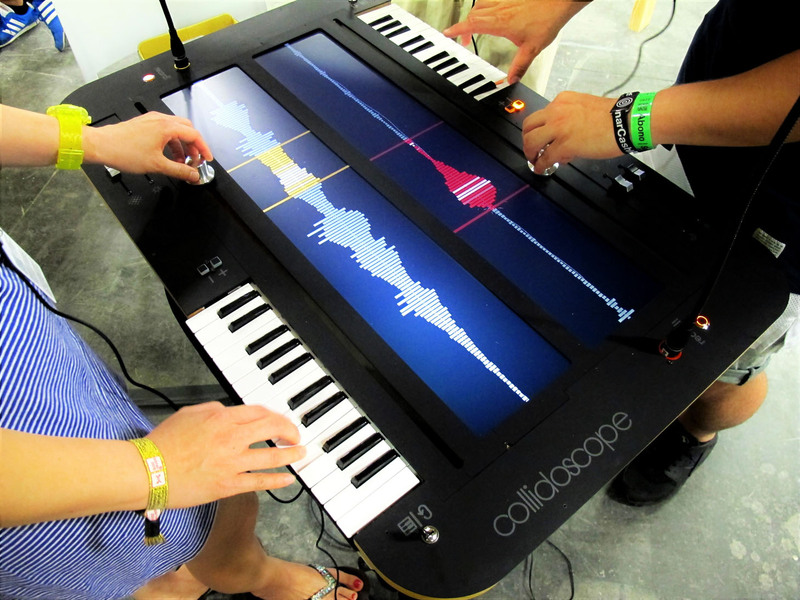 Collidoscope is an interactive, collaborative musical instrument that allows for seamlessly recording, manipulating, exploring, and performing real-world sounds. Via built-in microphones, players can record sounds (e.g., their voice) into Collidoscope and then explore these using large sliders alongside the displayed waveforms. In this way, players can move through the sounds, play them back at different speeds, freeze them at a particular position, loop part of them, or layer snippets on top of each other. This results in novel sound textures and timbres, which can then be played via the keyboard, allowing for both musical and explorative interaction. Two players "jamming" with Collidoscope.